As a traveling teacher and audiophile, one of the hardest things is to have access to a high level of quality music reproduction while away from home. Sure, if you’re just making week long trips it’s not a big deal; but if you have to work abroad for many months or even a year at a time, then you want to explore your hi-fi options. Of course these options need to be reasonably inexpensive because you want most of your money available for your home audio. As a teacher I have had the wonderful opportunity to travel and live and work in different countries the last few years. Before I left, I made sure that I brought a portable headphone amplifier and DAC with me to go along with my Sennheiser HD 600’s. The Total Bithead is a standout performer that runs on both 4 AAA batteries or directly from the USB output of a computer. It’s a little larger than an iPod Classic and quite light. It sounds quite good considering at the time it cost about $150, or less than many folks spend on cables – err ahem! Forget cables, that’s less than many folks spend on connectors. Bang for the buck in other words is high. Still like most audiophiles we always suspect there is more just beyond our reach. With good headphones like the Sennheiser HD 600, AKG 701, AKG 1000, Stax Omega II, Grado RS1 among many others, headphone guys will tell you that you need to get the most from them – just like great speakers. Take a quick look at www.headfi.org and you’ll see it’s one of the busiest audio forums on the internet. So naturally you’ll need quality amplification. Moreover, if you’re using a notebook computer as your source then an external DAC is a must. Being a traveler there wasn’t much point bringing my CD collection with me since I had no CD player – so I transferred my music collection to an external hard drive in lossless compression, theoretically retaining exactly what is on the CD. I say theoretically because besides compression schemes, factors that can corrupt the signal are too numerous. Nevertheless, it’s sometimes reassuring to see the massive amount of memory representing each album, and it’s probably as good as it can get. With a job in China that I could not refuse, I once again packed up my 9-year-old HD 600s, still as nice as the day I bought them despite all the travel, and off I went. I had the feeling that there must be some affordable tube options out there. I own an Antique Sound Labs MG Head DT (first generation) and it sounds quite good but it’s hardly portable at over 10lbs with a power supply built for Canada and the US. 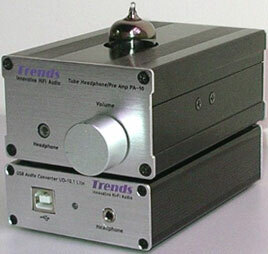 So enters the Trends PA-10 Tube Headphone/Pre Amplifier & UD-10.1 Lite USB Audio Converter. I was hoping for a one-box solution because part of the plan here was to review something portable for audiophiles on the go. However, my concerns over size and weight soon vanished. Combined, the two units are about 650g or well under 2lbs. You can also stack the headphone amp on top of the audio converter to save space. Starting with the UD-10.1 Lite Converter – this gadget is the lighter version of their bigger brother. Gadget? Well, when I opened the box that’s exactly what I felt I was looking at. The front (though it’s not easy to tell which side is the front and which is the back) has a USB input headphone output and a nice blue light (presumably the front) to tell you it’s on. The unit is powered via the USB from your notebook or home computer. On the back there is an optical and coaxial connector with an optional AC power connection. Sadly I can’t review the functionality of this unit as a cable converter; but if these features are important to you, this converter has been discussed quite a bit over at headfi.org and seems to be well regarded as an audio cable converter. My review will focus on the USB conversion in conjunction with the headphone amp/preamp. The Headphone amp/preamp is a nicely made unit that comes shipped with a single 12AU7 tube in a separate box. The headphone amp comes in a chassis with a single hole in the top for the user to put the tube in. Simple, but make sure you put the tube in straight. I heard a rather loud groaning sound with the tube touching the body. No problem, just moved the tube and the noise is gone. I am always impressed by the low noise of many tube amplifiers. This seems to fly in the face of accepted beliefs of tube gear but in my experience and with my own tube amps, noise, including hums, and other noises, have been very low indeed. I plugged the universal power supply into the wall outlet, plugged the headphones in (1/8th jack only) and flipped the switch on the back. A rather loud thump and audible noise – but 4 or 5 seconds later the noise disappeared and it settled in to a noise free session. This happened on every power-on as the tube warmed up – it can be a little disconcerting at first. The tube glowed a soft blue and it was time to settle in for a first round of listening. What immediately struck me about the rig was how fast the transients were and how open the combination was compared to my Total Bithead. Nothing against the Bithead as it has two devices in one much smaller box, but the Trends combination certainly lifted the veil and immediately justified its higher price. The combination offers quick transients, nice dynamic range, and a crisp clear open presentation favouring the midrange. The treble is clear and shies away from any hint of brightness, though a little grain can be detected in busier passages and treble extension, seems to me, to have been reduced to get away from accusations of listener fatigue. I would say this is a good decision in a headphone system. Bass is a little lightweight and not as deep as higher-end headphone systems, but even here it’s fast, tight and free of muddiness, again a good compromise. Delerium and Sarah McLachlan’s “Silence” has a lot going on at both frequency extremes and bass is nimble, midrange is clear and the whole thing sounded quite transparent. More importantly this combination is easy to listen to and fully engaging. Bass does not delve into the deepest of registers but there is enough drive and good timing to offset any minor quibbles. Then you look over at the price and you have a double take. Oh and did I mention it’s also a preamp? It’s kind of ridiculous that such a tube amp that works in any country, is light weight, small, works as both a headphone amp and a line preamp, looks nice, has respectable build quality, offers several DIY upgrade paths, and serves as a portable space heater (it runs bloody hot like a good tube amp should) can be offered at this kind of price. Sure there are better headphone amps and external DACs out there but let’s put things into some perspective. Headphone listening to some is a backup option and we don’t want to spend money in this area if it is going to take money away from our main stereo rig. At the same time we don’t want the headphone system to suffer too greatly. The Trends combination scores on both counts – the system sounds good, is relatively inexpensive, is highly portable, easily upgradeable and even if you should upgrade in the future you’re not at a total loss. You can always use the USB Audio cable converter for other purposes and the headphone amp will always serve as a portable option with a higher-end dedicated DA converter. The combination is more expensive than the Bithead but sounds significantly better as well. It’s not Christmas, but this is certainly the ultimate stocking stuffer combination since they will actually fit in a stocking. So keep it in mind when you’re searching for that gift for the audiophile junky in the family. Who are we kidding – that person is probably you, dear reader. Thanks for taking interest to review Trends PA-10 Tube headphone/Pre amp and Trends UD-10.1 Lite USB Audio Converter. I enjoyed reading the review and enjoyed a long email correspondence with Richard Austen. Richard is a very professional reviewer and the review was very complete, and I think very accurately captured the essence of the Trends PA-10 and Trends UD-10.1 Lite. As we all know, using a PC/Mac/iPod as a source component is becoming popular, we hope our affordable Hi-Fi gears can attract more music lover and youngsters to join into the computer audiophile field.